Finally! A well-composed solution for storing music, movies, video games and all the accessories! Available only at The Container Store, our exclusive Elfa Utility Media Room Door & Wall Rack Solution provides three adjustable Media Racks that can be positioned anywhere along the vertical Elfa Standard to hold your media. Media Rack Dividers keep the contents in order and to separate different media formats. Three repositionable Baskets for all your media-related accessories are included. 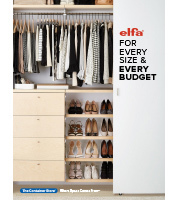 Build your own customized solution with our Elfa Utility Door & Wall Rack Planner. Are the hooks that mount the rack onto the door adjustable? My door is 79.5&quot; tall. Will this fit? How wide are the media racks/baskets? Details say 80&quot; in height but there's no width info. The width is 17 1/4&quot;. The overdoor hooks can be tightened at the top so that the rack fits the door snugly and does not move around.